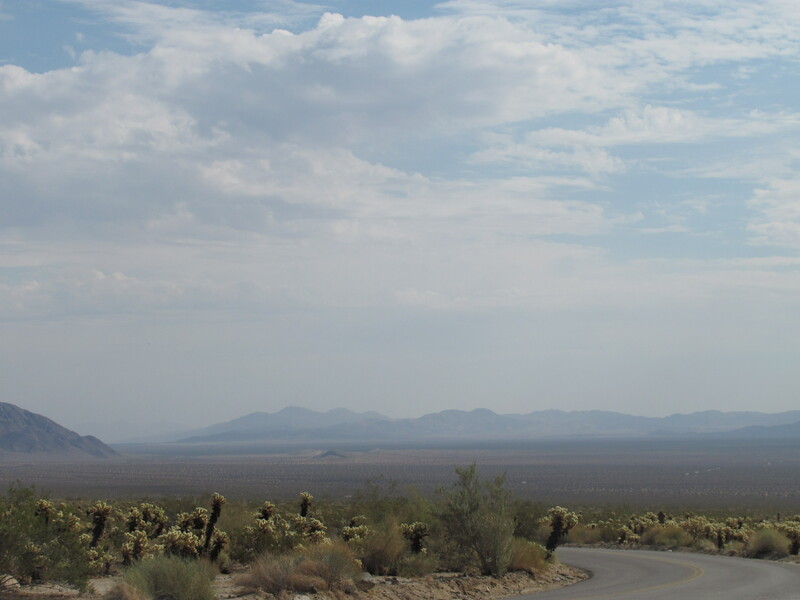 Immediately upon leaving Joshua Tree National Park, the desert around me took on a starker appearance. I saw almost none of the “megaflora” characteristic of the Mojave Desert in the park – no Joshua Trees, no mesquite, none of the larger cacti. In fact, the desert that had seemed so full of life in the park now looked like the vast wasteland I had always imagined it to be. 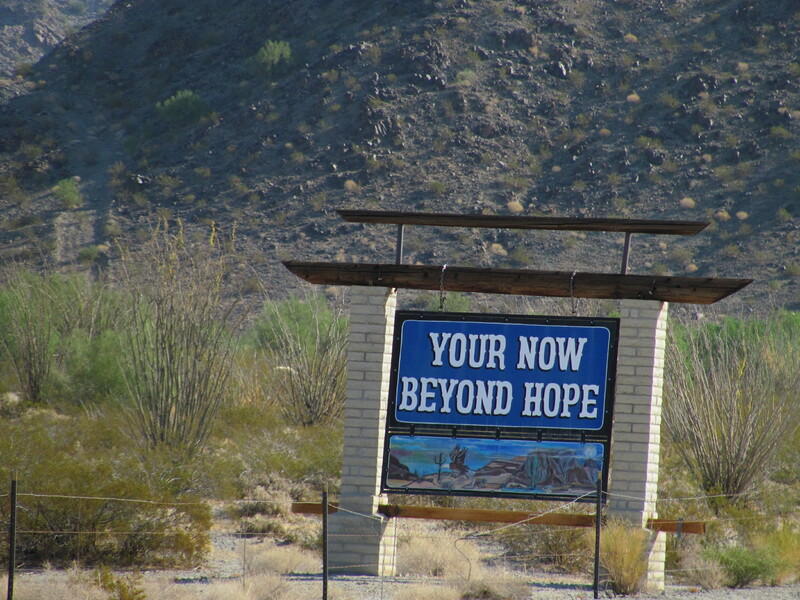 For the most part, this continued to be the case as I headed straight east into Arizona, soon crossing back into the Sonoran Desert. The towns I passed through on my way, few and far between, looked equally bleak. I think that it was the lack of water, combined with generally mild temperatures, that made the buildings and their landscaping somehow less “civilized”-looking than what I am used to. There was, of course, dust everywhere, buildings didn’t need to have the sturdy roofs and walls that northern snow and cold require, and there wasn’t the water to spare for elaborate gardens, let alone lawns (though some homes, apparently to show off their good wells, had palm trees planted in the yard). That said, there isn’t much of an economy in the area, aside from ranching and whatever is needed to serve the immediate needs of those ranchers, fifty miles or more from the nearest town of 1,000. I’m not sure what keeps people out there – though, to be honest, I’m still not completely sure why people tried to settle there in the first place, unless it was the strangely beautiful, otherworldly appearance of the desert. 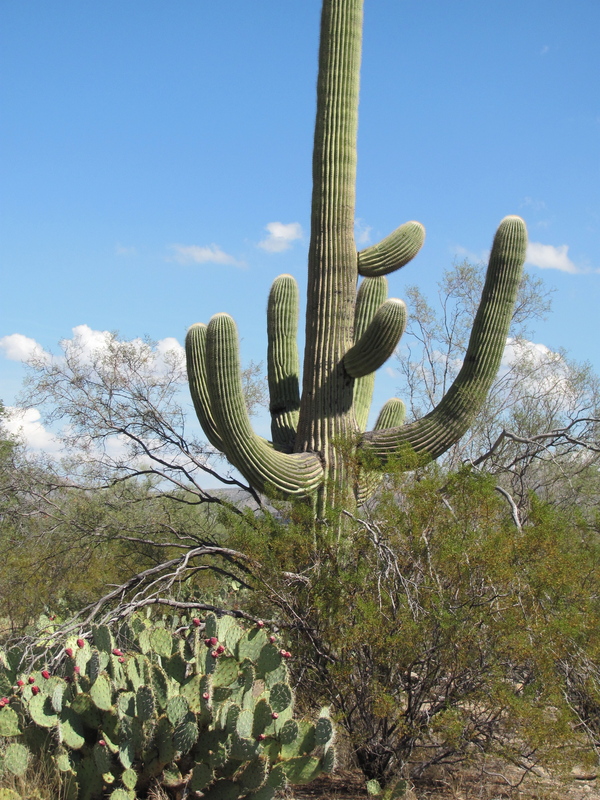 The charismatic cactus of the Sonoran Desert is the saguaro, which can grow up to 50 feet tall. Sometimes called the giant saguaro, they are the largest cactus species in the United States. Like the Joshua Trees, large populations of saguaros look like forests, with the other cacti, shrubs, and even small trees serving as the “underbrush.” I, however, saw only a few saguaros scattered here and there along the hundreds of miles I traveled through eastern California and western Arizona. This was particularly true in central Arizona, south and west of Phoenix, where ranching and (what passed for) cropland were clearly widespread. 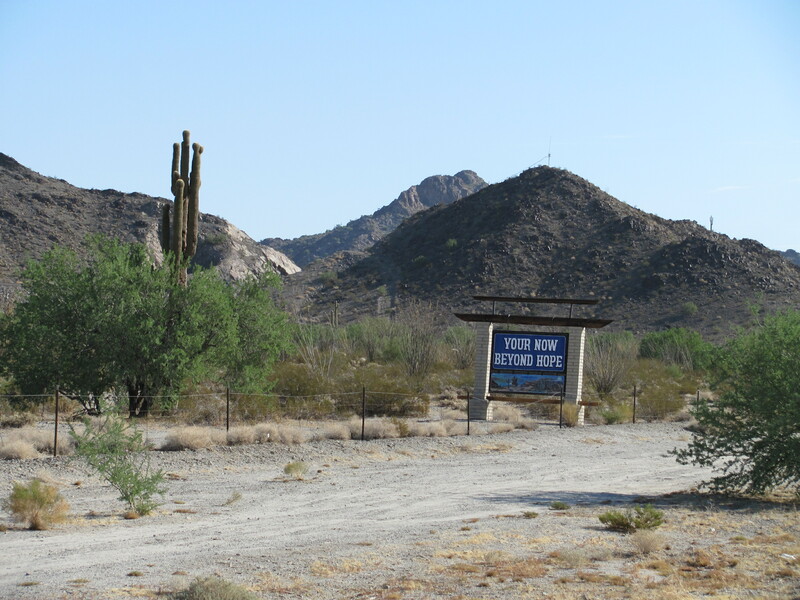 Just outside of Tucson, though, lies Saguaro National Park, set aside to preserve some of the great “saguaro forests” and the rest of the ecological community of the Sonoran Desert. 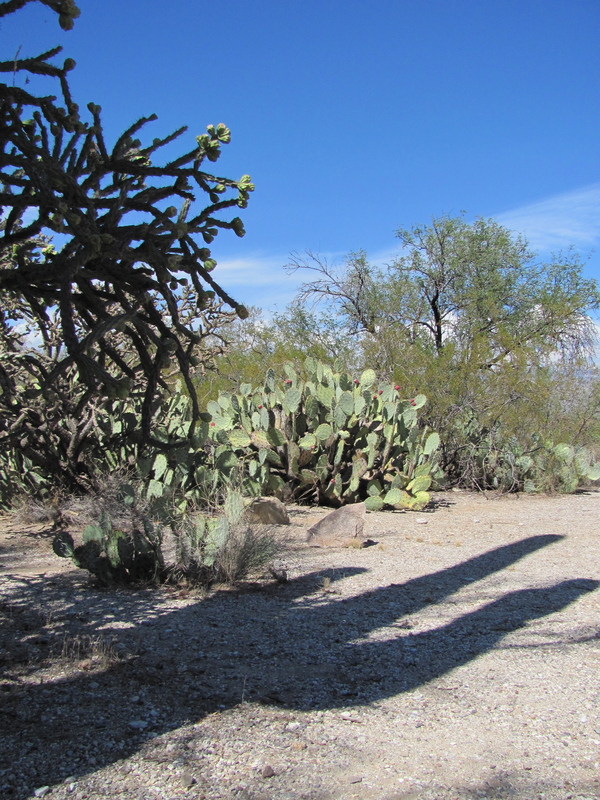 Why are these giants of the desert – the saguaro and the Joshua tree – nearly invisible outside of the preserves named for them? I’m not completely sure, but it seems pretty clear that humans are responsible, at some level. The saguaros in Saguaro N.P. 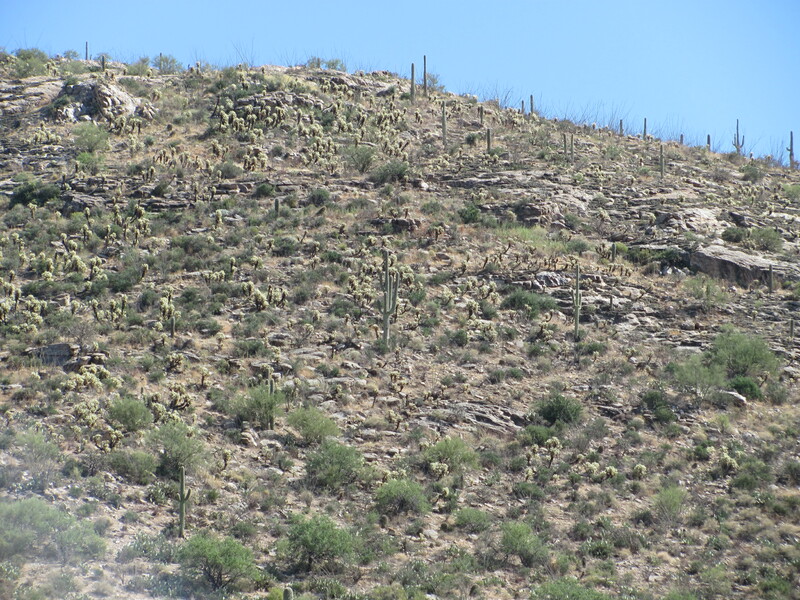 are actually at the edge of their range – in a terrain too steep and cold to support agriculture as reliably as the flats (and in Arizona, that’s really saying something). Joshua Tree N.P. is in one little corner of the Mojave Desert, yet even in the adjacent town named for that giant agave, there were few Joshua trees around. 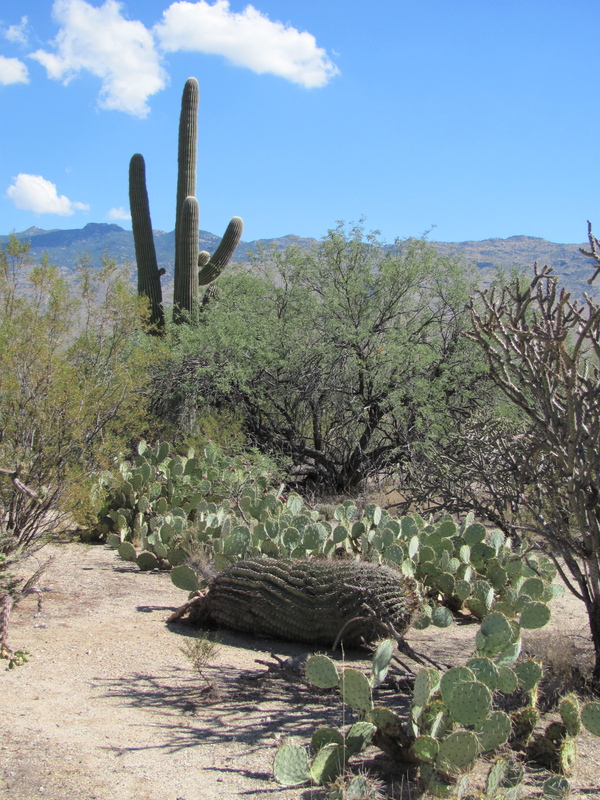 Both plants, but especially the saguaro, have had human uses for as long as people have inhabited the desert. 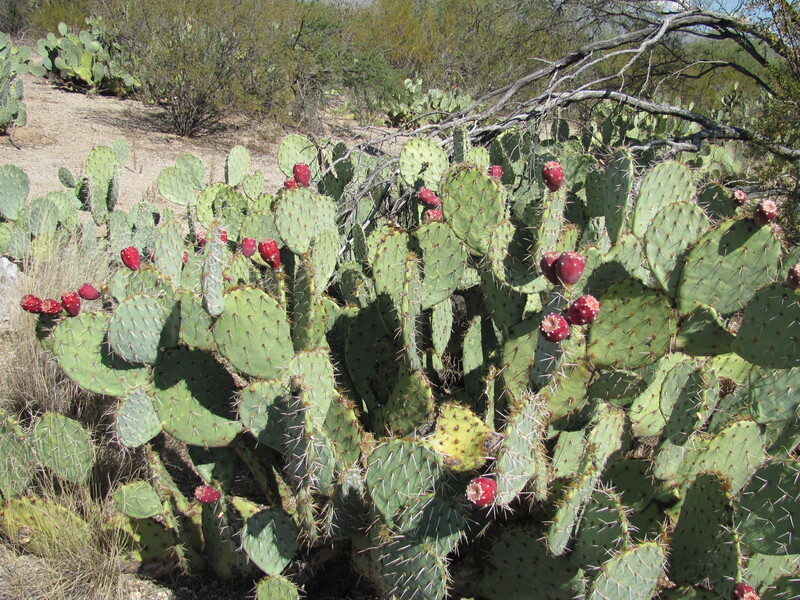 The Tohono O’odham, and the ancient Hohokam before them, ate and preserved the juicy fruits and used the woody stems for building. It seems likely that early Europeans in the area would have done the same, as a substitute for non-existent trees. 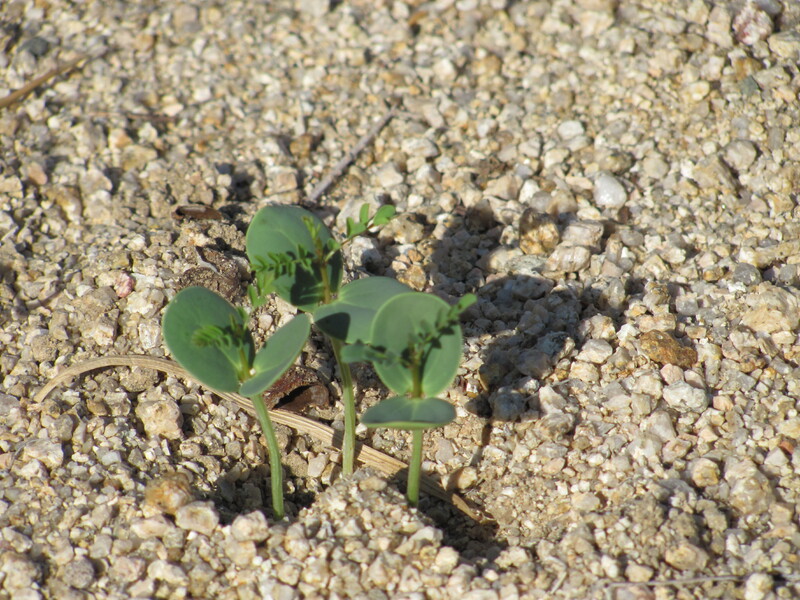 In addition, grazing animals compact the soil and trample young seedlings. removing all of the remaining fruits and seeds, will clearly have a devastating effect on the population. 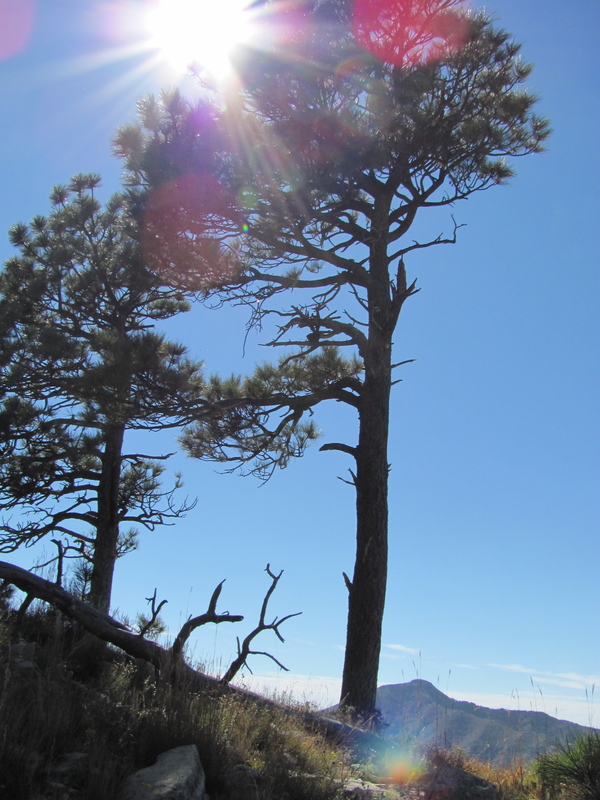 the eastern side, one can hike up to scrub oak and even Ponderosa pine forests. 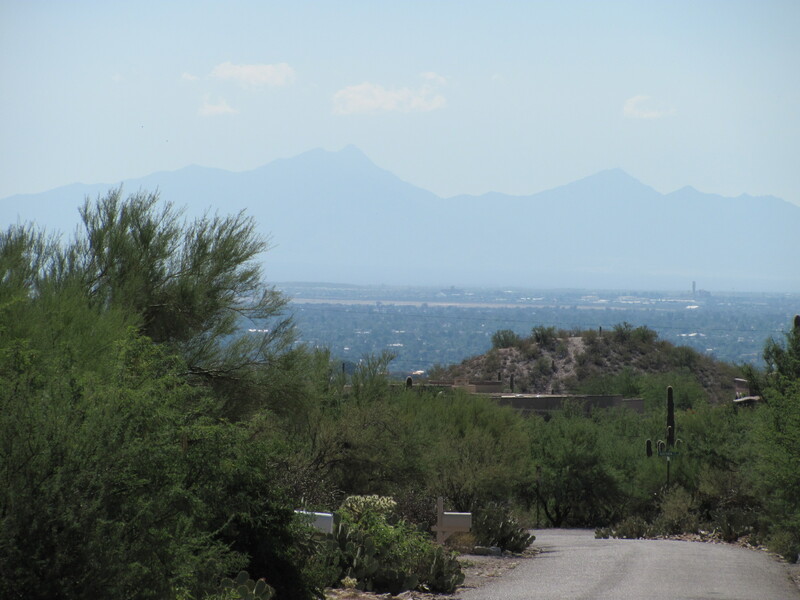 Tucson itself, which lies between the two parks, is a beautiful desert city, with towering cacti in front yards and mountains surrounding the town. My own (great-) aunt’s garden, in the foothills north of downtown, was as beautiful as the National Parks, if slightly less wild. A "river" in the Sonoran Desert of western Arizona. 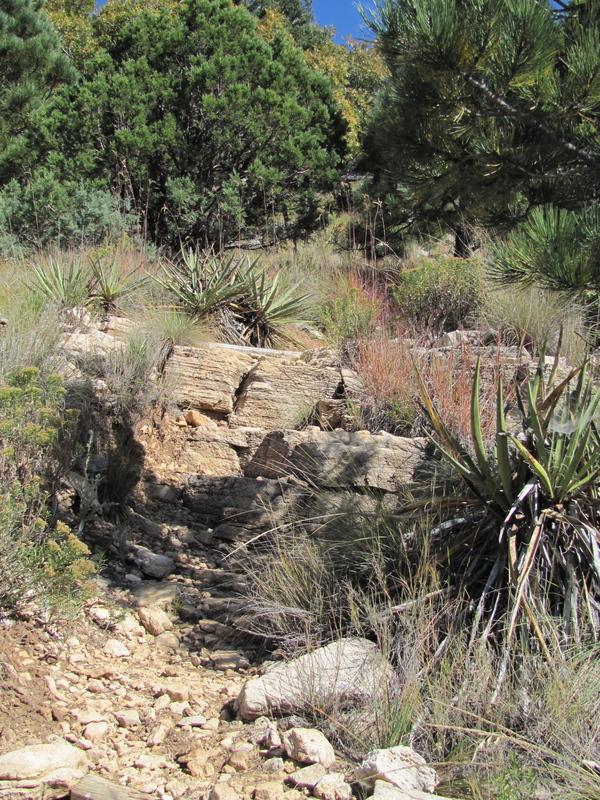 This channel is flooded with water when it storms, and an ORV trail in dry weather. I spent a week getting from the San Francisco Bay to the Texas Hill Country, passing through three deserts and four states. For a good representation of how arid this country is, even in the agricultural areas, check out the Trip-Tick page of my journey, and note the river crossings. I crossed a total of ten (10) rivers in the two thousand (2,000) miles of this leg, and most of those were dry. The Colorado River (at the AZ/CA border) and the Rio Grande (where I met it in central New Mexico) were the only ones with significant water in them, until arriving in eastern Texas. I crossed more water-bearing aqueducts than natural flowages. That’s not to say that there isn’t life in the desert, though. 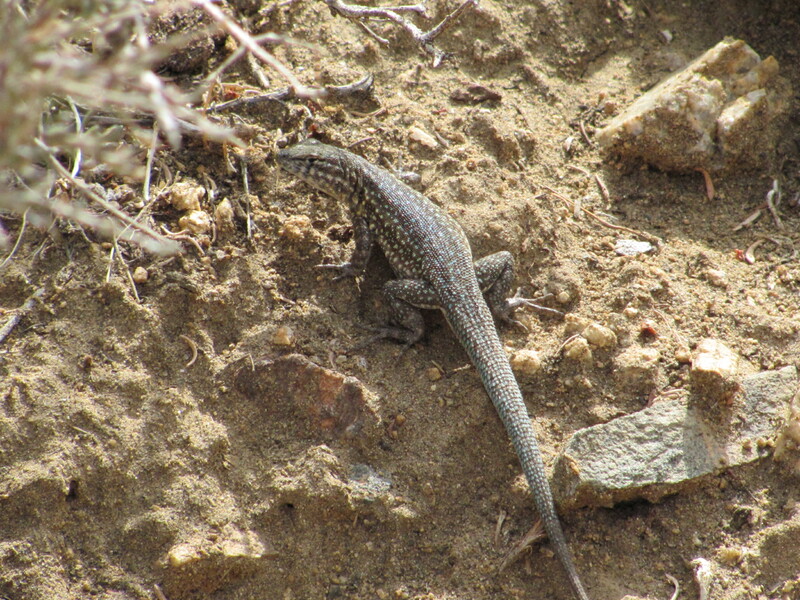 In fact, when I arrived at Joshua Tree National Park a few hours after sunset, I had been expecting silence and stillness – instead I was assaulted by the chirping of crickets, flying and crawling insects, and the noises of little lizards crawling around in the bushes. 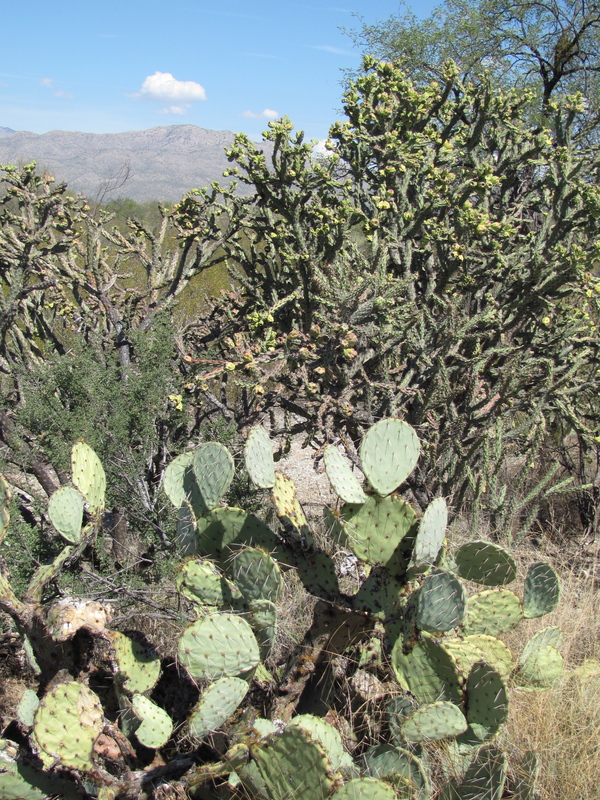 Well, not exactly bushes – mostly in the cactus and agave. I’m getting ahead of myself a little bit, though. Between Oakland and Joshua Tree are 500 miles of Central California. It looks a lot like what you might expect: very flat, very brown, lots of irrigation systems watering the vegetable crops and orchards. In the morning, I could see workers driving the dusty roads between fields, and watering the trees individually with a small ladder truck. 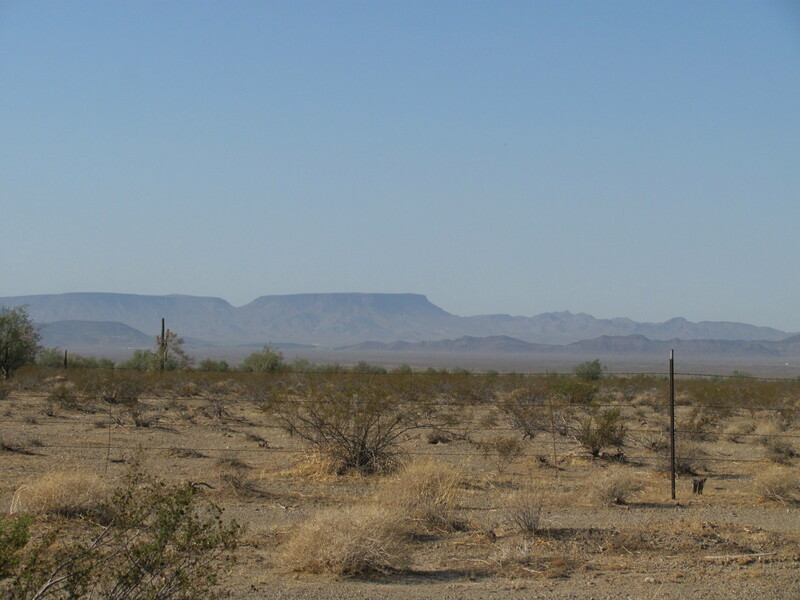 Most of the way from the hills of Los Angeles to the Colorado Desert of southeast California was driven in darkness, but the monotony of the flat, dry landscape was still apparent. I could clearly see why Palm Springs is both literally and figuratively an oasis on that route. It was a little bit surreal to all of a sudden emerge from the total darkness to tastefully lit resorts and subdivisions surrounded by enormous palms. Large lighted signs for impending concerts by famous pop stars (and once-famous pop stars) lined the road, and casinos and golf courses beckoned. I’m not on a luxury vacation, however, so I stopped only long enough for gas before plunging again into the dark night, heading east into the heart of the desert. After crossing a set of small mountains, it wasn’t too much longer before I got to Joshua Tree NP. however, with little grass growing between the brush or cactus, and dust blowing up at each breath of wind. and animals, decaying organic material, and all of the other things that make sand or soil elsewhere. And I imagine that the desert winds, which blow unchecked by trees across vast stretches of land, blows away the finer particles more quickly. 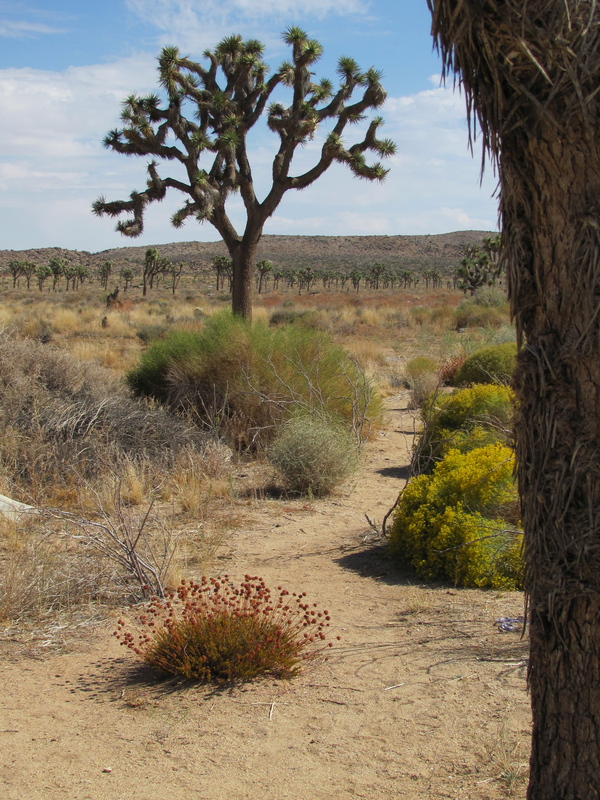 One of the interesting things about Joshua Tree NP is that it is on the border between the Colorado and Mohave Deserts, so I went north and west, which was also uphill, and found myself in a slightly cooler, slightly damper ecosystem. I was told that it was less hot and dry, at least on the scale of yearly averages, but didn’t notice a difference myself on a sunny fall day. 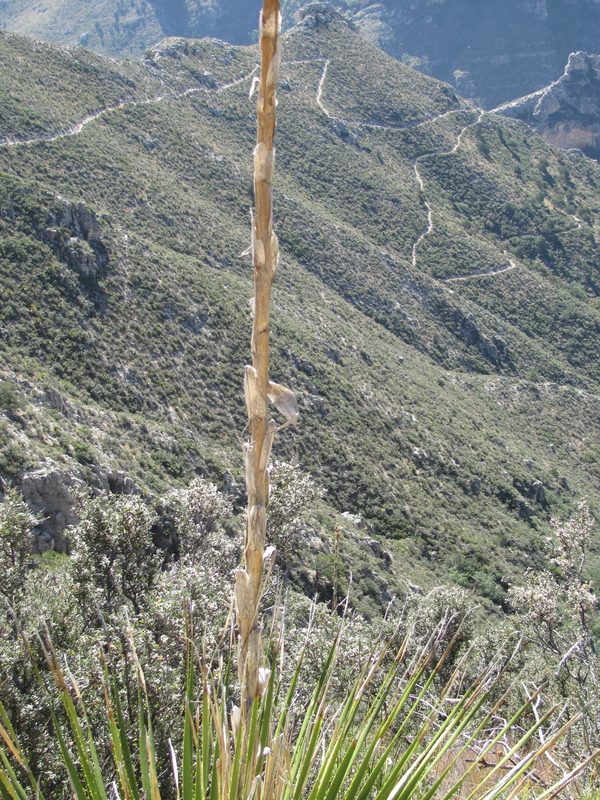 The vegetation, however, was denser and taller, and the Joshua Tree (really an enormous species of agave that proliferates in those conditions) was everywhere. Check out my next post for more pictures of the park! After leaving Joshua Tree and driving east towards Arizona, I was struck by how much more barren the landscape became. I didn’t have an opportunity to look into it, but I assume that human land use practices have affected the diversity of vegetation and viability of natural plant communities. Certainly much of that area, as well as western Arizona, was fenced for grazing, though I didn’t really see much grass in there, let alone cattle. There was more grass than I had seen in either desert in the park, however. I’m not sure if the grass is planted or if there is just more moisture in certain locales. 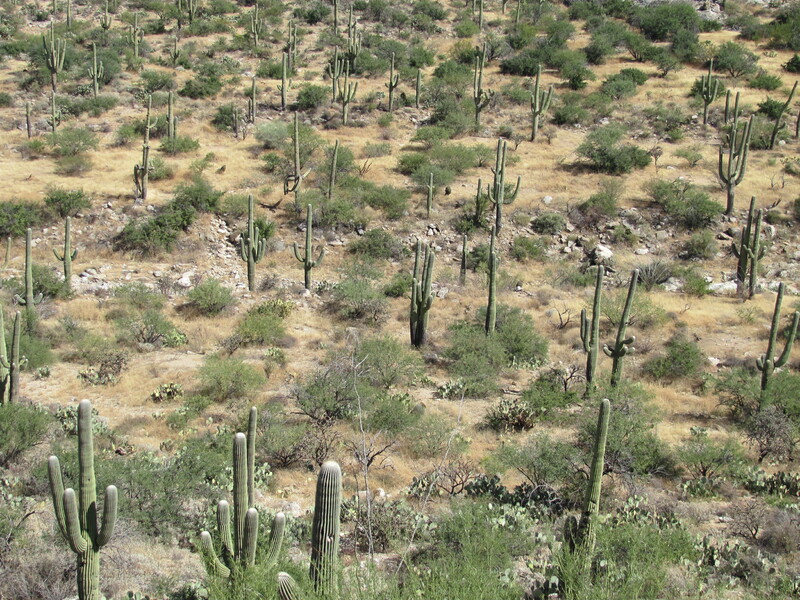 In either case, though, if it’s grazed, I can imagine that the cacti would be removed to prevent harm to the animals. Anyone with knowledge on this is welcome to inform me! I crossed the Colorado River at Parker, AZ, just below the dam that forms Lake Havasu. Even in the dark, when I got out of my car, I could tell that there was moisture in the air. It is amazing how different things smell when they are wet! I had not particularly noticed the scent of the desert – primarily because it doesn’t smell like much at all, I think. Of course, the vegetation by the river was also much greener, denser, and more varied, which would account for smelling more like green plants and the more humid air, but I had a similar experience in northwest Texas, as well. 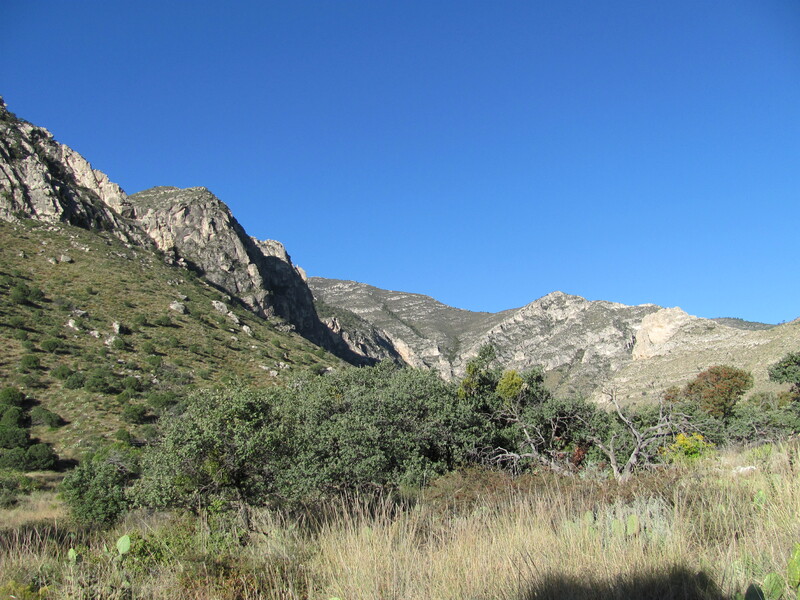 There, I spent a couple days in the Guadalupe Mountains, which is on the edge of the Chihuahuan Desert. Despite the higher rainfall and warmer average temperatures in that area, which bring about greater diversity and density of plant and animal species, there still wasn’t much scent in the air this time of year. On my last morning there, however, a light drizzle fell, and it brought out that dry-damp smell that comes even up north after long periods without rain. However, it was stronger than I ever remember it being. I assume it is because the rain is dampening and washing away greater accumulated amounts of pollen, dust, decay, etc. Either that, or the daily variety of scents in a temperate climate cause me not to notice them as much individually. In the relative absence of odor, maybe anything that is giving off water smells more strongly. Again, though, I’m jumping ahead. 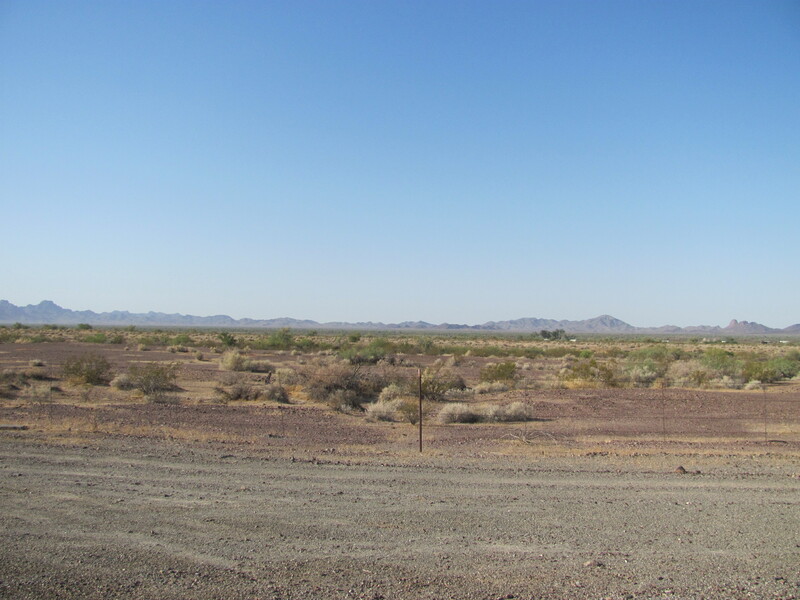 I spent a day crossing Arizona, through more of the same desert ranch-land. Here and there, I saw heavily irrigated hay-fields, which stood out as bright green against the beige desert. Quite a bit of cotton was also grown there. In fact, I don’t think I have ever seen a cotton field, and it took me a while to figure out what it was. There were also fields of sweet sorghum, which is used not only as a feed crop but also, apparently, as a source of ethanol in the Southwest. It was larger than the sorghum I’d seen growing in the upper Midwest, and I actually had to look it up before deciding if it was that or some odd variety of corn. All of these crops, all the grazing, all the watering of the many homes in Arizona (the area including Tucson and Phoenix is the 5th-fastest growing region in the country) does not come without a price. 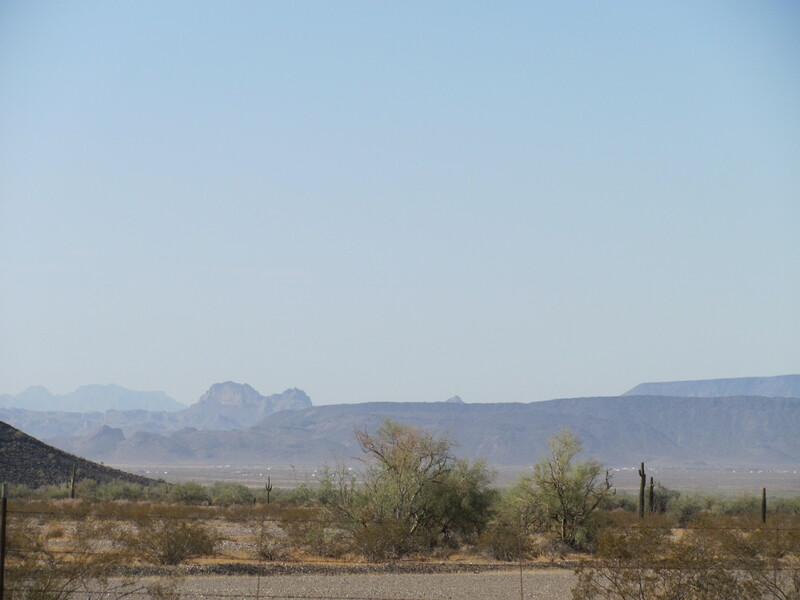 While visiting Casa Grande National Monument in south central AZ, I read a statistic from 1988 that the water level in the aquifer had dropped over a hundred feet in fifty years. 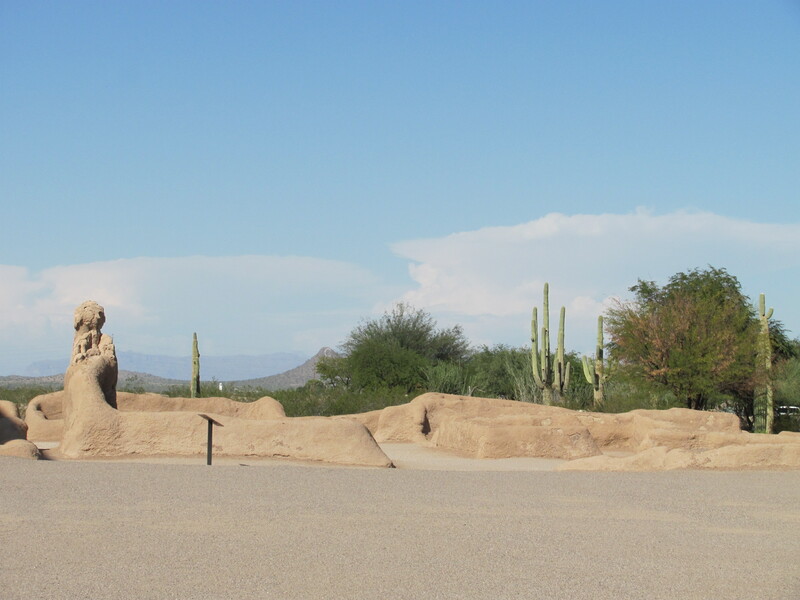 Casa Grande, which I’ll cover in more detail in a later post, is the ruins of a Native American village, complete with four-story buildings, from almost a thousand years ago. They were primarily an agricultural community, drawing water not only from a complicated system of canals and aqueducts, but also allowing the roots of hardy plants to draw their own water from the aquifer. Today, the park noted, many of the mesquite trees were dying, as the water level had dropped from an average of twelve feet below the ground to over 120 feet deep, and the roots could no longer reach it. Of course, I also came to understand why people might want to live in the desert, when I spent the night with my Aunt Peggy in Tucson. Her beautiful home in the foothills, with a lovely cactus garden and sun almost every day of the year is certainly inviting! I did not spend long there, but hope to return again soon for some hiking and exploring, both of the town itself, and the surrounding areas. Saguaro National Park, in particular, piqued my interest, but I only took a quick drive through the park’s scenic loop road. This is an example of the Sonoran Desert at its finest: lots of saguaro cacti, plus plenty of prickly pear, barrel cactus, and various agaves and brush species. 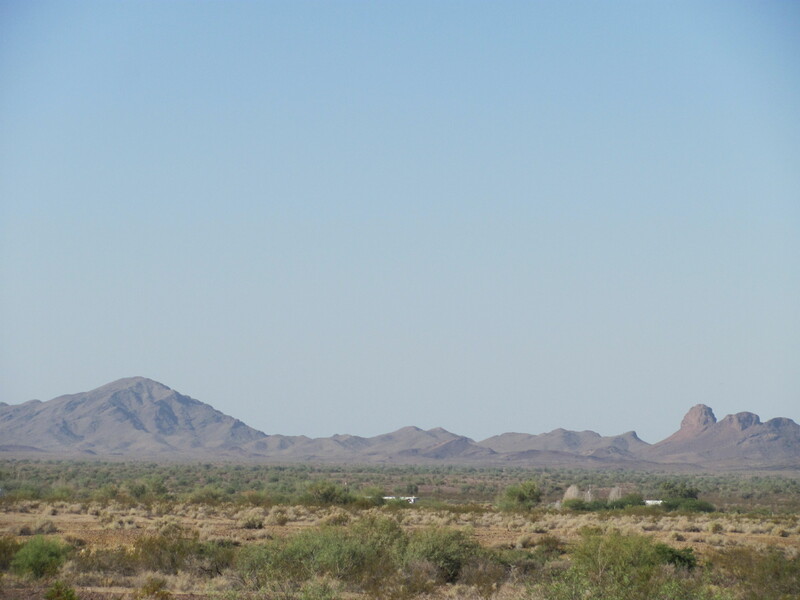 I left Tucson for New Mexico, and drove east on I-10 through many, many miles of unvarying terrain. 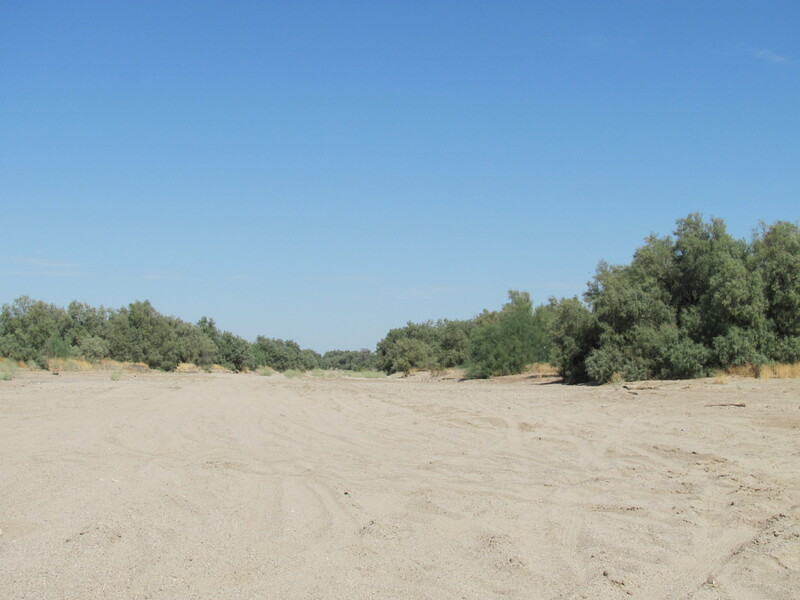 In Las Cruces, New Mexico, I crossed the Rio Grande River, carrying a little water on its way down to form the southern border of the United States. It wasn’t quite as “Grande” yet as it would become later. I continued east in the dark, so I can’t tell you a thing about White Sands except for this: Alamogordo is 70 miles from Las Cruces, and I could see its lights as clearly from one end of that desert as from the other. It is completely flat and clearly dry. 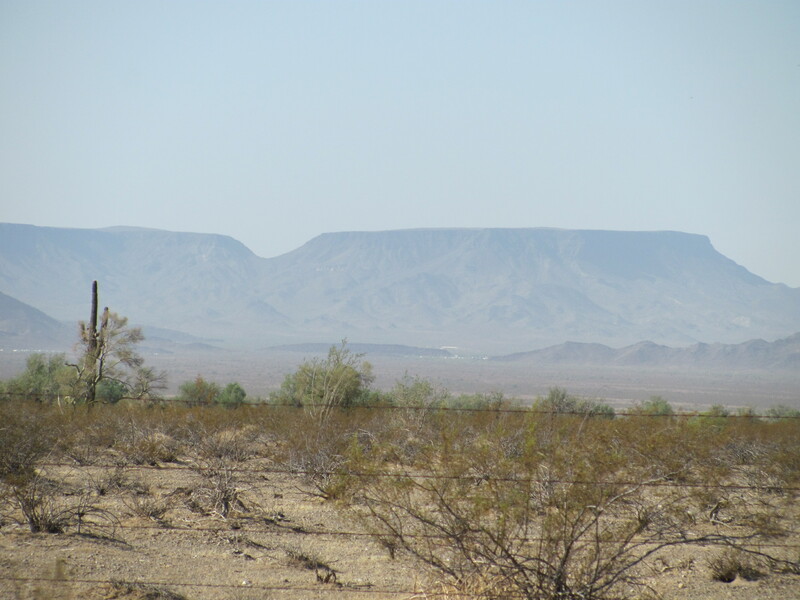 East of Alamogordo, I began to climb into the mountains – the southern continuation of the Rockies, though much lower in height and the breadth of the range does not extend as far as it does to the north. Despite the darkness, I could imagine how beautiful the view must be, and I sensed the changing climate around me. I spent a night in the company of friends near Cloudcroft, in a pine forest – the very high desert, I might call it, and the chill of that mountain night was refreshing after all the warm weather I’d had; it felt good to put on a sweatshirt! 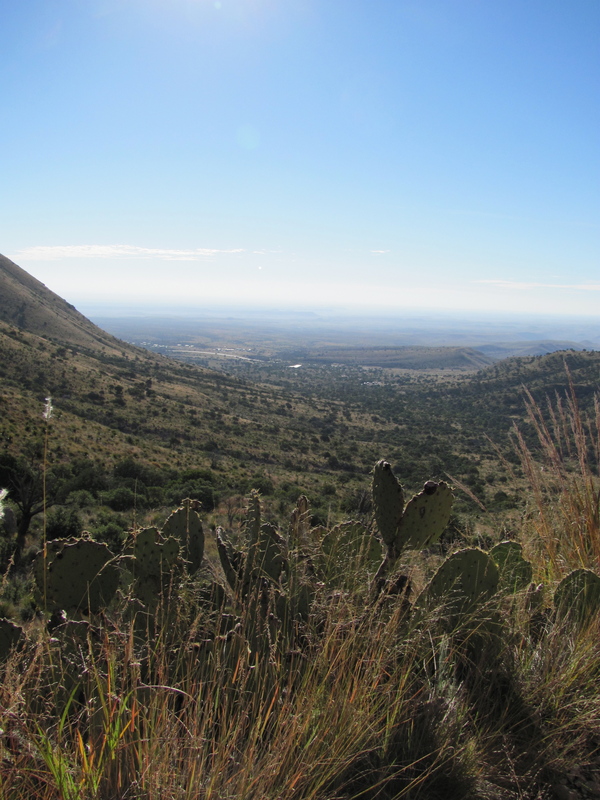 Guadalupe Mountains NP in northwest Texas. 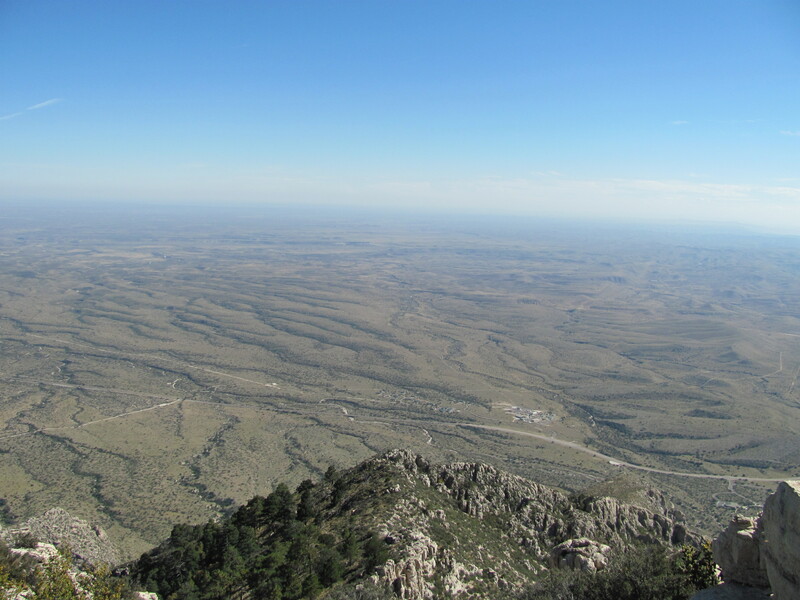 These parks fall within the Chihuahuan Desert, in the Guadalupe Mountain range, which formed as a reef on the edge of a prehistoric inland sea. The mountains are beautiful, and the variety of vegetation in the low desert, the relatively moist canyons, and the oak-and-pine-covered peaks was amazing. I definitely liked this place the best of all my desert travels, so you can expect plenty of photos in future posts on the Guadalupes and the Caverns. Guadalupe Peak is the highest point in Texas, and with over five hundred miles to go to Austin, I’m tempted to say it was all downhill from there. Not true! I will go into more detail on the mountains of West Texas, the central plains, and the Hill Country, not to mention Austin itself, after the next few posts that will flesh out these desert adventures. You’ll have to keep tuned for all that excitement!